Lately, my 8-year old daughter has been addicted to the piano. It is a wonderful feeling to see her head off to the piano every single morning after breakfast (without being asked…yippee!). I’m not going to lie and pretend that she’s always been a self-motivated player. We’ve had our practice struggles, just like anyone else. But this year she’s found independence on the keys… and it’s made all the difference in the world; she has the confidence and the tools to work through difficulties on her own. 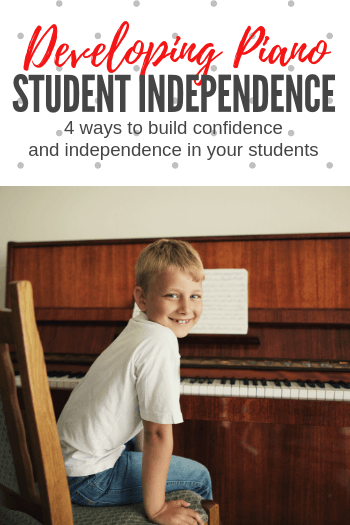 … then you’ll be excited to know that we’re sharing 4 great activities you can use to encourage independence in your piano students! Some piano students are full of confidence and are happy to plough forward… making mistakes at will, and happily puzzling through difficulties. Others can be so dependent on a teacher’s assistance that they end up hurting their own progress. So, how do I transition my piano students form dependant to independent? Instruct your piano student to select a sticker. Keep this sticker in your hand. Have your student play as far as she can through her current piece without asking for help. Once she reaches a place where help is required, place the sticker above the last independently performed measure. Because it’s a game, your student is more likely to attempt to keep going further than she may have previously… and it also serves as a great visual reminder of what she is able to accomplish solo. Now, when she comes to piano lessons next week her task is to “beat the sticker”; that is… to progress independently beyond her previous mark. This activity is great for teaching independent problem solving skills with “never-before-seen” music. At the end of a lesson, mark a piano piece in your student’s book that she has never before played. Using a sticky note, cover any one measure in this piece. For homework, instruct your piano student to learn just that single “Mystery Measure” under the sticky note for the next lesson. It seems simple, but learning a Mystery Measure may require your student to identify new hand positions, key signatures, complicated rhythms etc. Once your student finds success with decoding music on her own, even if it’s only one measure, she will eventually be more willing to try larger bits of material. Do you have students who need you to “talk them through” their piece? I have… and still do! In the past, when I would attempt to encourage problem solving through my silence, they’d usually look at me desperately and lose their train of thought. However, once we started playing “Reboot the Teacher”, they realized that getting the answer from me wasn’t as easy as… staring; they had to be an active part of the process too. To play Reboot the Teacher, your job is simple… be silent. Your student can ask for your assistance when needed, but only if she first “re-boots the teacher” by feeding you some information that is relevant to what she is attempting to figure out. For example, if your student reaches an unfamiliar note, to “reboot you” and get your assistance, she would first need to say, “It’s a line note… it’s above treble C… and it has a sharp.”. You can then “magically” spring to life and show her how these clues can then be used to solve her problem. Students who “get stuck” at home, need strategies for working through their difficulties. Without a teacher or a musically-inclined parent to assist them, many kids will experience a week of little to no progress. We shared this printable last year containing 4 “work it out” strategies that you can send home to with your students. It is an effective way of filling their At Home Toolbox. The more your piano students use these strategies, the more independent they will become, both at home and in lessons. Want your piano students to really take ownership over practice? Try sending home, Shhhh… Your Piano Teacher Thinks This Is Practice; 88 piano practice activities that are absolutely, positively, most definitely, NOT BORING! As teachers, we’re all trying to work ourselves out of a job. It’s a silly saying, but it is true. We all want to create independent musicians who can work their way successfully through a never-before-seen piece of music. Building these skills begins with the smallest baby steps towards independence. So the next time your student pauses and waits for your verbal cue… or glances at you for help… try one of these 4 strategies… or… read and share in the comments below! What do you do to wean your students away from constant assistance?